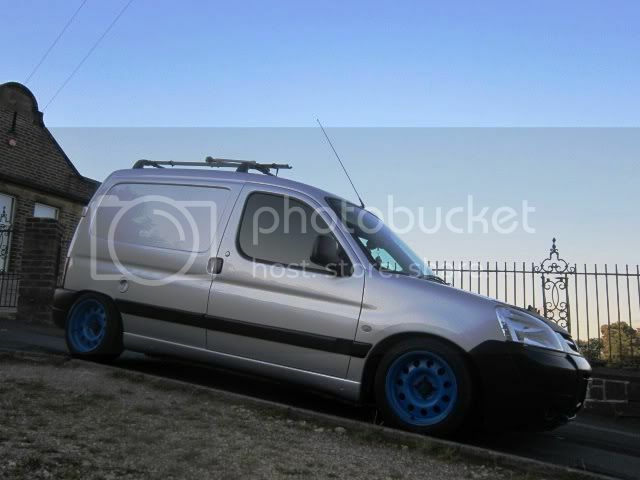 I about to buy a set of coilovers for the berlingo.. I want it to lower about 11cm.. Coil over kit only goes down a bout 6cm.. I saw PeteA 's van.. and that is the look i want.. He says.. that its lowered about 60mm but that doesnt comply with what i measure... To get this i should go at least 10cm..
Spring rate will be totally wrong for the Berlingo though, may as well just chop the springs illyme: Thats as low as the coilovers go, thinking of removing the helper springs which get it abit lower at some point in the future. I have 306 TA Technix coilovers on my Partner, it rides perfectly. I've taken the helper springs out, but not wound the platforms all the way down yet, as I'm in the process of pulling the torsion bars out to lower the rear. (19-12-2012, 10:45 PM)FeuxLingo Wrote: I have 306 TA Technix coilovers on my Partner, it rides perfectly. I've taken the helper springs out, but not wound the platforms all the way down yet, as I'm in the process of pulling the torsion bars out to lower the rear. Sorry, I honestly cannot understand 80% of what you type. Can you run your replies through a spell-checker before posting?